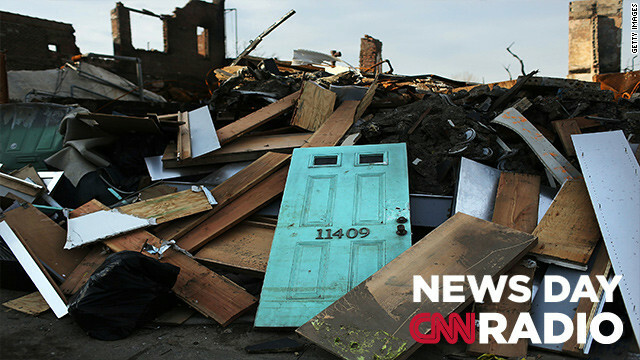 The remains of destroyed homes and businesses are viewed after Superstorm Sandy in the Rockaways on January 2, 2013 in the Queens borough of New York City. "I was chasing the Speaker all over the House floor last night, trying to talk to him and his staff...and then he was gone. He refused to meet with us...he just decided to sneak off in the dark of night. " The uproar among members of his own party forced House Speaker John Boehner into action. Congressman King met with the speaker this afternoon and says Boehner has now promised a vote on $9 billion in Sandy disaster aid by this Friday and then another vote on the remaining $51 billion dollars in aid in two weeks. "It's just great news for the American consumer and law-abiding debt collectors. Now there's going to be two cops on the beat, instead of just one." "So, when we did talk all my mom would want to do is try to rush as many questions to me."